Lovers of turquoise seashores, sunshine, and history will find a thousand and one things to do in Croatia. Famed for its 1800 kilometers of ruggedly resplendent aqua-blue coastline Croatia is usually viewed as a beach break destination. And while there are plenty of beaches to blissfully pass the hours upon, there is much else to see and do in Croatia. There are more Roman ruins, Gothic cathedrals, and limestone encrusted town squares in Croatia than you can shake a stick at. History buffs will totally geek out over the architecture and preserved beauty found within many of the best cities in Croatia. Foodies will gorge on fresh seafood and delicious local produce, while party animals will feel right at home in many of Croatia’s coastal towns and cities. And then there are, of course, the countless multitudes of islands, beaches, coves, and bays; all embraced by the crystal depths of the salty Adriatic Sea. To truly explore Croatia you’ll need weeks. Months. Maybe a lifetime, if you want to get poetic about it. Croatia is gorgeous. This is where we drop the mic and walk away, never to write another word again. We COULD do that, since there isn’t much more that need be said. Croatia is gorgeous and you should go see it. Right now. 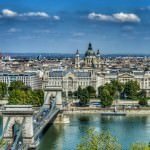 Let’s get our Croatia travel guide started with some basic information about Croatia, and what you should know before you go. Visa: A visa is not required for citizens of the United States, UK, EU, Canada, Australia, and New Zealand. Visiting for 90 out of 180 day period is allowed. Click here for more details about visa requirements in Croatia. Tipping: 10% for waiters, none for taxi drivers, 15 kuna for porters in a hotel, round up the bill at bars, and 10-15 kuna for tour guides. Car Rentals: If you’re looking to rent a car in Croatia click here for prices and options. For years we had both harbored a deep longing to visit Croatia in the summer. We wanted to check out the orange rooftops and azure waters for ourselves, but we were afraid that the costs might be prohibitive. Well, after spending five weeks traveling around the country we are happy to report that it is possible to visit Croatia on a backpacking budget. Sure, you can spend hundreds of dollars a day if you wish. You don’t have to be rich to travel Croatia, however. The intrepid traveler can experience Croatia in all its glory for as little as $35 to $50 dollars a day. You also don’t have to be a hostel frequenting backpacker to travel Croatia on a budget. If you are traveling in a group of two or more you can find accommodations at affordable prices, even during high season. If you stick to cooking your own meals, frequently use super markets and farmer’s markets, and take buses to get around the country your daily expenses will be quite manageable. Check out more of our budget travel tips! The Bell Tower of St. Domnius in Split. Croatia becomes SUPER affordable in the off season. But more on that later. During our month in Croatia we generally stuck to the mainland. Island hopping in Croatia is a ton of fun, but unless you have your own boat the costs can get a bit out of control. This is a great guide to island hopping Croatia, if that’s what you are looking for. Below we discuss five of the best cities to visit when you travel in Croatia. Each of these cities has a multitude of amazing sights and experiences to offer. Four of them can be seen on a budget during the summer high season and the fifth can be managed, even in high season. So, without further ado, our Croatia travel guide! Our first destination in Croatia was the capital Zagreb. We arrived straight into the city from Slovenia by bus and spent six days exploring the city center. It didn’t take us long to come to a grand realization. Croatia’s capital is a criminally under-rated destination. Perhaps Croatia’s famed coastline just hogs up all the spot light. Maybe our own personal bias played a part. We just didn’t expect much out of Zagreb before arriving. 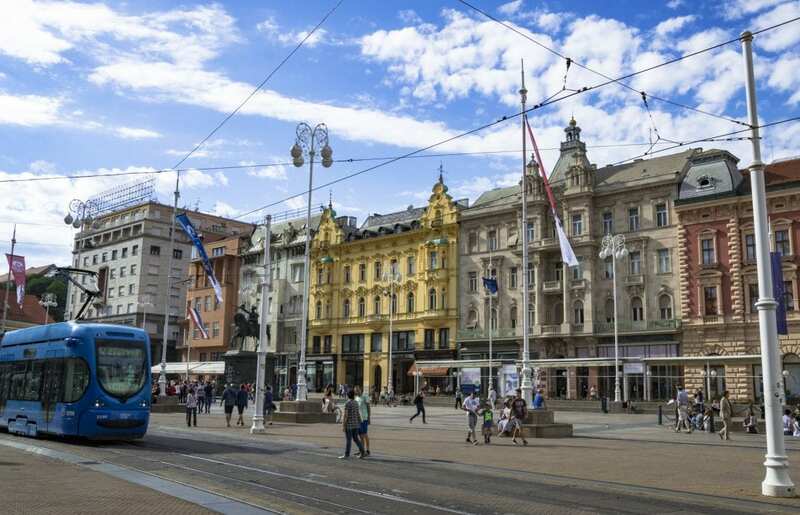 Whatever the case may be Zagreb has been flying under the radar and deserves its fair share of attention. Zagreb’s historic center is one of the coolest we have explored, and we have seen a LOT of old town centers during our time in Europe. 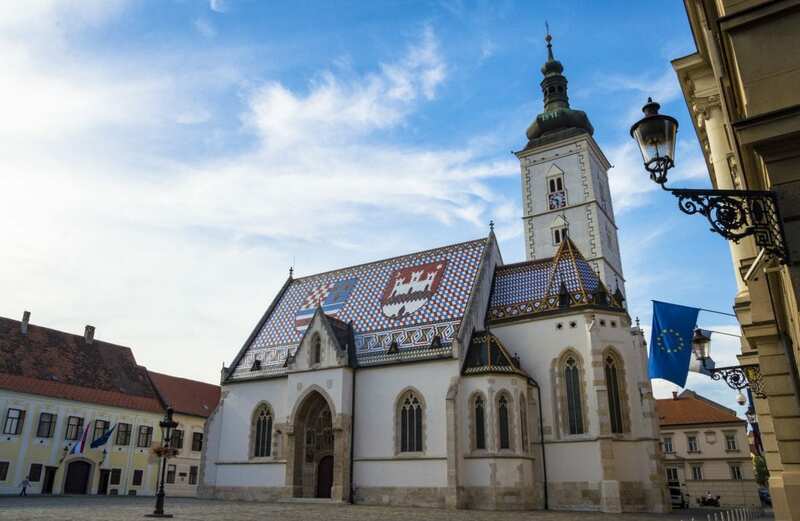 As Croatia’s least expensive major destination we applaud Zagreb for its historic beauty, its resplendent old town center, and the positive disposition of its people. This is pretty much a no-brainer. 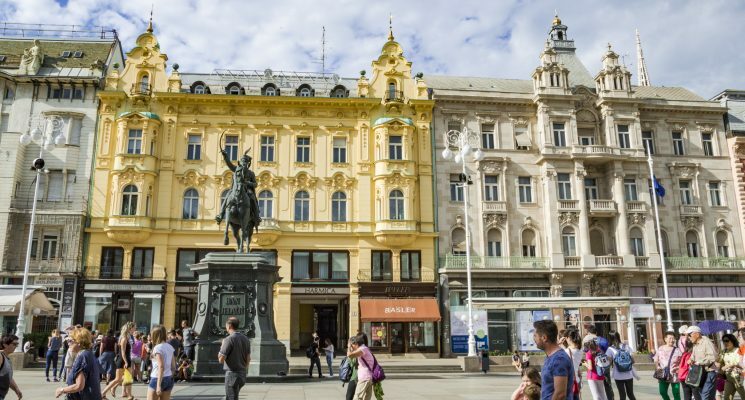 Walking around the old town is what you SHOULD be doing if visiting Zagreb for only a day or two. 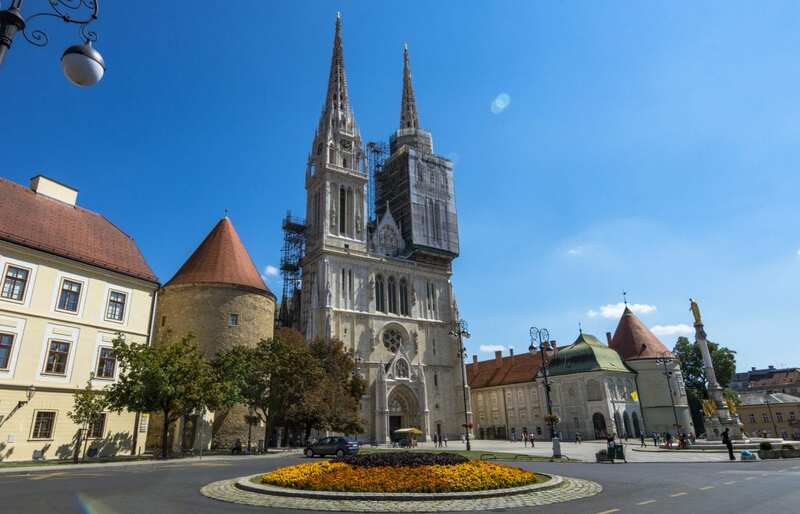 The Cathedral of the Assumption of the Blessed Virgin Mary is the tallest structure in Croatia AND the largest Gothic building in the Balkans. You can’t miss it if you are anywhere near the center. Yes, this museum is exactly what it sounds like. A collection of remnants that tell stories of broken relationships. The Museum of Broken Relationships started as a traveling exhibition focusing on the ruins of human relationships with the aim of helping those who experienced them receive some sort of closure. All of the exhibits are composed of donations from people around the world and their stories. Mementos include everything from love letters, to suicide notes, to stuffed animals, wedding dresses, headphones, and even ecstasy pills. Depending on what kind of mood you’re in, and whether or not you’ve healed from your own broken relationship with a loved one, the museum can be cathartic, therapeutic, or downright upsetting. A solid ice cream sundae or stiff shot might be in order upon your departure. Despite that, it’s totally worth a visit. This resting place for the dearly departed has been around since the late 19th century. We know exploring cemeteries is considered morbid by some, but we are fascinated by the history and the stories found within them. 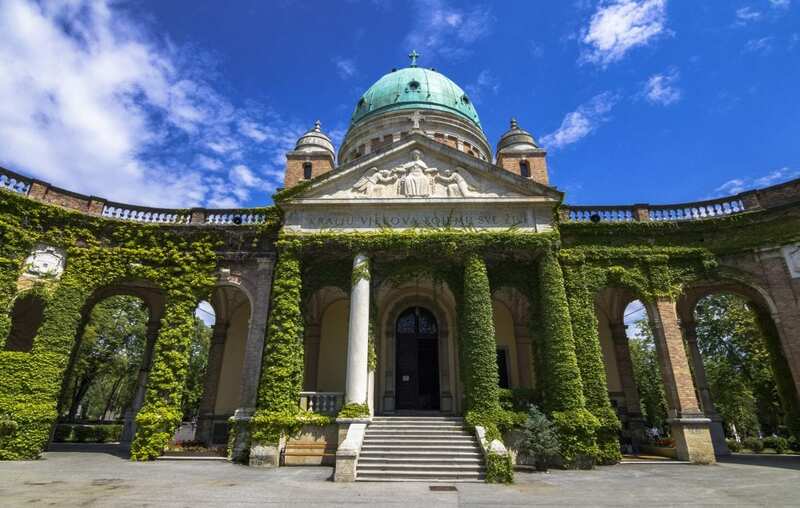 Mirogoj Cemetery is worth visiting for the history, and for its vine covered architecture (as shown above). Chilean barman/owner Julio mixes fantastic and strong margaritas, mojitos, and other classics all with a bespoke twist in this centrally located bar. Strong drinks aren’t the only reason to drop by. The funky decor of Corazon Mio mixes discarded high heel shoes nailed to the ceiling, decrepit barbie dolls arranged into murals, and a Rocky Horror aesthetic to paint a vibrant and funky ambiance. So when in Zagreb, make sure to visit this unique bar and embrace your weird side over a couple of tasty cocktails. Make sure you visit the bathroom for a giggle. Oh, and there is a great tapas place right across the street. Check that out too! If you’re planning on renting an apartment during your stay in Zagreb, we highly recommend this one. We lived in Zagreb for a week and stayed in this modern one bedroom rental. We couldn’t have been more pleased. Comfortable, cozy, and stocked with everything a traveler needs to feel at home. 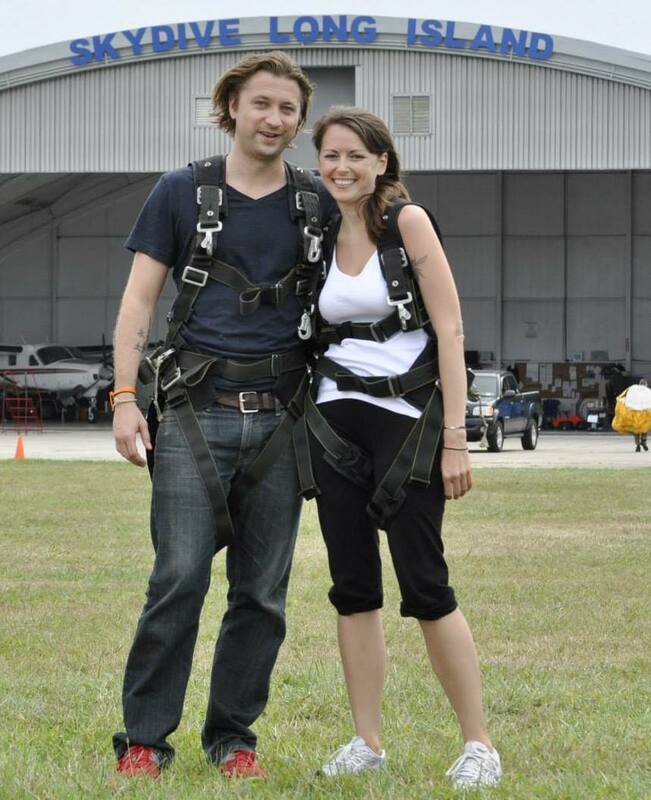 The owner is extremely friendly, accommodating, and always available to answer questions. Not a bad deal for two or even three people traveling together. Note: if there are three of you this rental is actually cheaper than three dorm beds. Swanky Mint Hostel: Centrally located in what was once a factory, the hostel has plenty of rooms of all sizes to choose from and affords guests plenty of socializing opportunities, including a garden, sun terrace, and bar. Click for reviews, more details, or for the best prices on Swanky Mint Hostel. 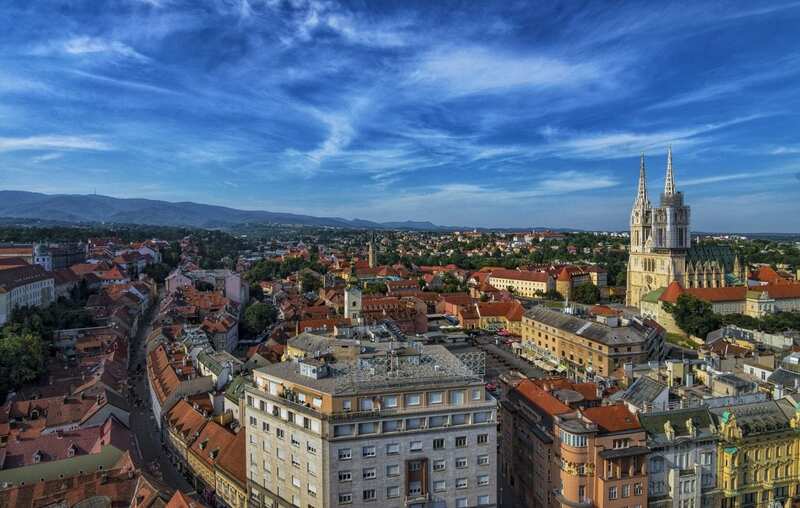 For more options, check out our complete guide to the best hostels in Zagreb! Garden Hotel: Beautifully renovated Four Star Hotel in central Zagreb with extremely helpful and friendly staff. Click here for more information, reviews, or to book now. Art Hotel Like: Stunning three star art hotel with beautifully decorated rooms, friendly staff, and loads of character. Click here for more info, reviews, or to book now. Zadar’s old town is home to impressive roman ruins, intriguing medieval architecture, and limestone streets. The city is relatively quiet, even at the height of the tourism season, and offers visitors an intimate introduction to the wonders of Croatia’s past, and to the buoyant delight of the Adriatic Sea. 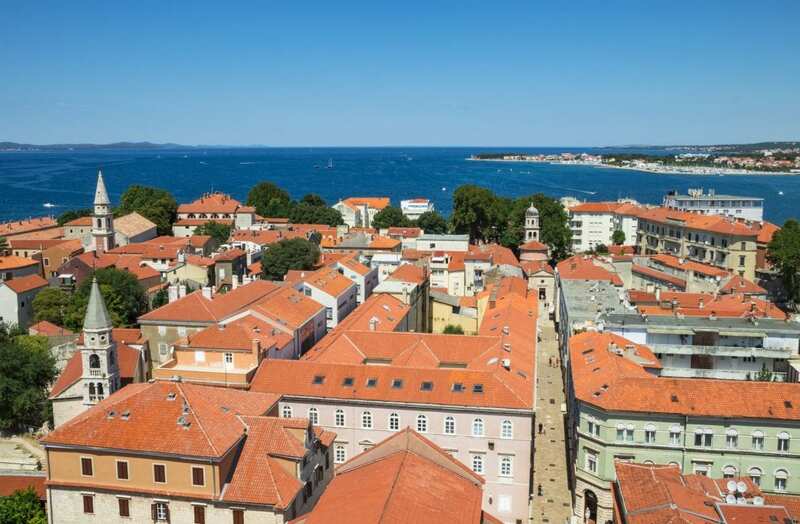 Zadar is easily reachable by bus from Zagreb, and makes for a great stop between the capital city and destinations further south along the beautiful coastline. 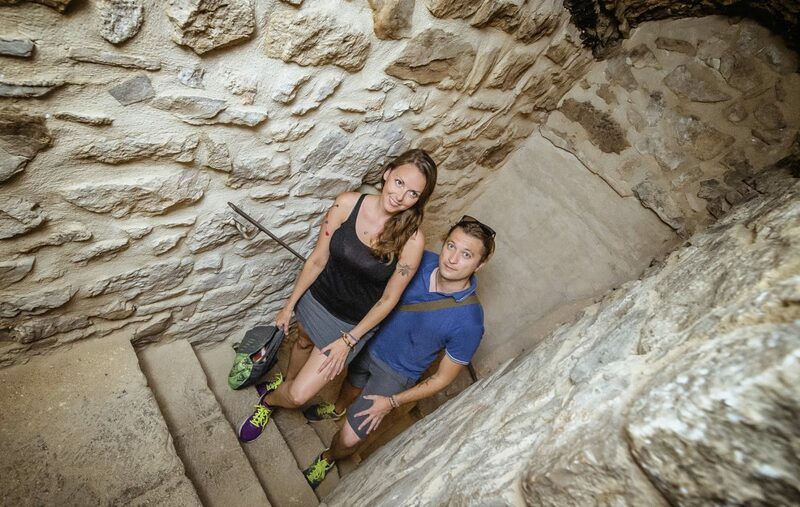 Exploring the old town is THE thing to do in Zadar. 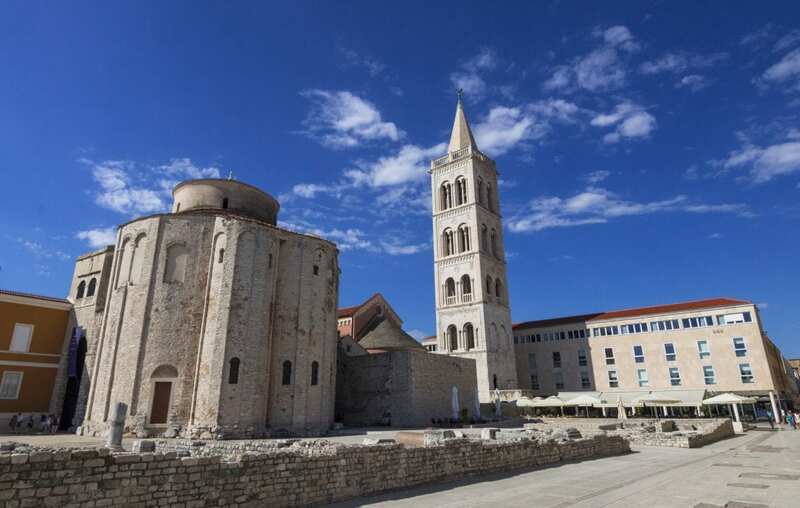 The white limestone of Zadar’s old town, polished smooth by Father Time, gleams when under the embrace of the summer sun. To visit Zadar is to realize how necessary sunglasses really are. So bring your shades when you set out for a jaunt in this bleached relic of an old town center. 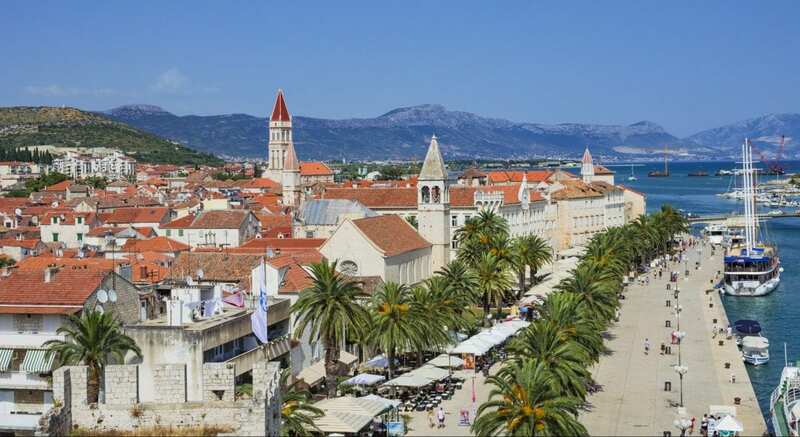 Stroll the main cross streets, take a walk along the magnificent coastal walls, and then enjoy a cold drink in the shade of the many canopied terraces you will find. Do so in May or October if you want to really stretch your budget and ingest the city in a more intimate fashion. Have you ever wondered what the sea sounds like? In Zadar you can find out. Take a stroll along the water to the most northwestern tip of the old town and visit the city’s famous Sea Organ. This peculiar art instillation was created by architect Nikola Bašić and opened to the public in 2005. The west end of Zadar’s seaside promenade houses a massive water fueled organ. The instrument comes to life with tranquil and sometimes chaotic sounds when seawater rushes in an out of its pipes. Zadar is home to some modest pebbled beaches, good for a swim on a hot day. An undeniably alluring prospect after a sweaty morning exploring the old town. Zadar is famed for its golden sunsets. Don’t miss out. Make sure to know what time the sun sets and head to the Sea Organ to take in a Sun Salutation with other visitors. For a more private encounter with the setting sun head for a stretch of coast around a kilometer or so south of the old harbor. Boutique Hostel Forum: Funky and bold, the Boutique Hostel Forum is great for backpackers seeking dorm rooms, or those looking for a more private experience. With superb reviews and a location that can’t be beat, it’s certainly one of the best hostels in Zadar. Click here for more info, reviews, or to book your stay. The Hostel: If tranquility is what you’re after in Zadar, The Hostel is the perfect location for you. The unique and modern hostel is located in a historic building a 5 minute walk from the Old Town. Click here for more info, reviews, or to book your stay. Art Hotel Kalelarga: Beautifully decorated four star hotel located in the heart of the Old Town. Click here for more info, reviews, or to book your stay. Hotel Delfin: Three star hotel located a one minute walk from the beach with en-suit rooms, tranquil setting, and friendly staff. Click here for more info, reviews, or to book your stay. Split’s old town is, quite literally, a palace. In the late 5th century the Roman emperor Diocletian decided he would be better off not actually living in Rome, as most Roman Emperors had a bad habit of dying early. Being an Emperor of Rome and all he had a whole bunch of subservient laborers and slaves build him a lavish palace right along the water on a gorgeous stretch of Croatian coastline. This enormous palace/fortress stands to this day, making up around half of Split’s incredible old town. Never before, outside of Italy, have we walked as well a preserved Roman complex as we did when exploring old town Split. The narrow alleys and expansive courtyards a true treat to wander, and if you forgive us for using this often over-used expression again, walking in the old town feels like taking a step back in time. 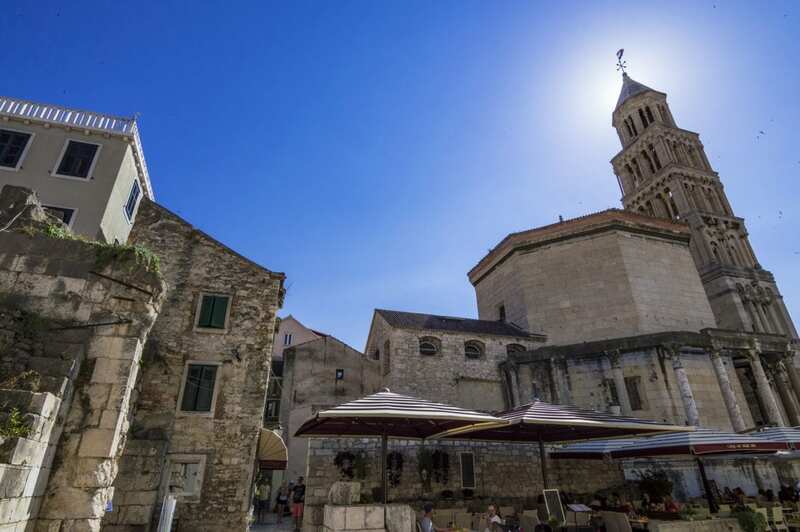 There is more to Split than just cobbled limestone streets, and ancient buildings. 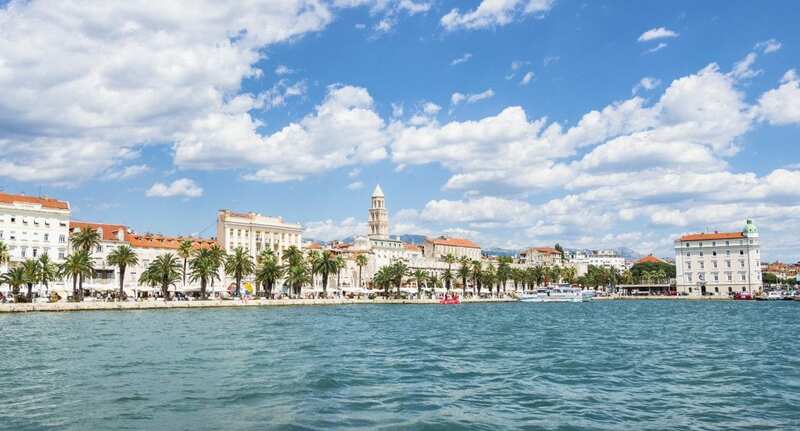 Split’s harbor makes a great base of operations to visit certain islands in the Adriatic, the town is filled with bars, restaurants, and cafes to drink and make merry, and there are no less than four beaches within easy walking distance. 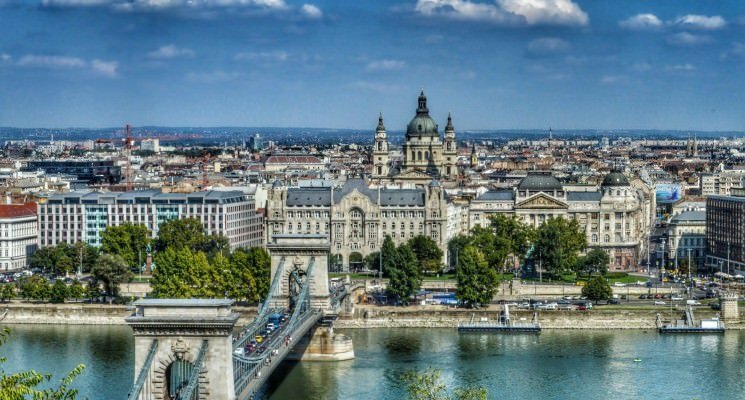 Traveling Split on a budget is slightly tricky during high season, but still totally doable. Again, your costs will be greatly reduced if you travel in a group of two or more, supermarkets are your best friend, and kitchens to cook your meals in will save you tons of cash. Solo budget travelers will find that hostel beds for €20 to €35 a night in Split. Off season travel sees greatly reduced prices for accommodations in Split, in some instances by over 50% or more. If you can manage it, we recommend visiting Split for at least a week in May or October. In conclusion, Split is freaking awesome! We spent almost three weeks living there and would go back in a heartbeat. 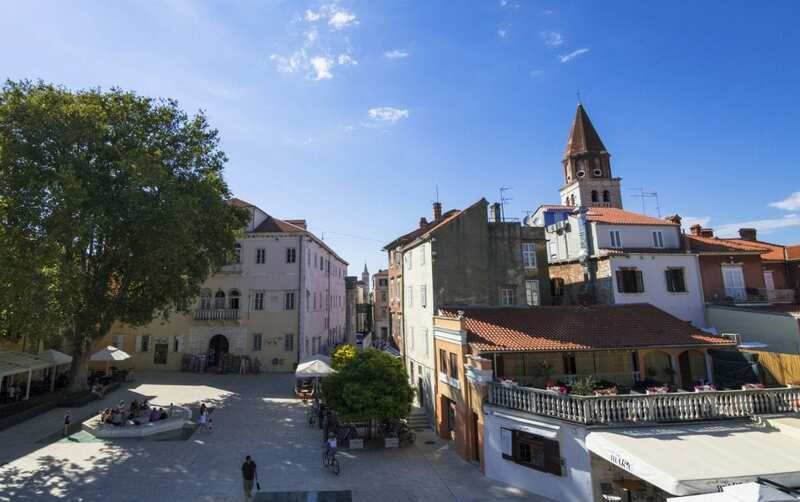 Make sure to climb the top of Bell Tower of St. Domnius, drink a mixer in Voćni trg (Fruit Square), and have coffee in Prokurative Square. Take a historical tour of the old town with Vjeran Mlacic (vjeranmlacic@gmail.com), who gave us a private tour that we found informative, entertaining, and highly enjoyable. Oh, and if you are into HBO’s Game of Thrones there are a few locations around the center that you might want to check out. Plenty to keep you nice, busy, and potentially buzzed in Split’s old town for at least a day or two. The island of Hvar is a two hour ferry ride from Split. It’s worth taking a full day trip from Split to Hvar if you are staying in the city for at least a few days. Hvar is pretty touristic, and is not the cheapest destination in Croatia, but we figure the views are worth seeing at least once. If you have some extra budget to burn staying in Hvar for a night or two wouldn’t be the worst decision you ever made either. Ferries leave regularly all day long from the south end of the harbor, and there are private boat trips you can take as well if you are traveling with a large group of if you just don’t care about droppin’ dollars (lucky you!). The small island of Solta is a short 50 minute ferry ride from Split, but it might as well be another world. Gone are the crowds of tourists you are likely encountering if visiting in the summer. Gone is the hustle and bustle of commerce, tourism, and daily life. Solta is tiny, quiet, and beautiful. We visited this island twice for swimming and relaxing in the sparkling blue waters of a secluded cove. Pack a lunch, some brews, water, sunscreen and snacks and go find your own private cove. (Pro Tip – when you get off the ferry in Solta head to the right along a dirt path that takes you along the coast. Walk for about a kilometer for secluded beauty). This small town is about 3o minutes north of Split. It is easily accessible by buses leaving from the main station, and along stops on the road heading out of Split. As you can see above Trogir is totally worth taking a day trip from Split. Feel like going to the beach but don’t feel like going far? Well, you’re are in luck. There are a few really nice pebble beaches to the west of Split’s center. The best ones are about a 30 minute walk, or a short bus ride away. The bus only comes once a hour, however. There are a couple of beaches to the east of town which are closer, but we don’t really recommend those. Go west young traveler, go west. Have a Private Photo Shoot! 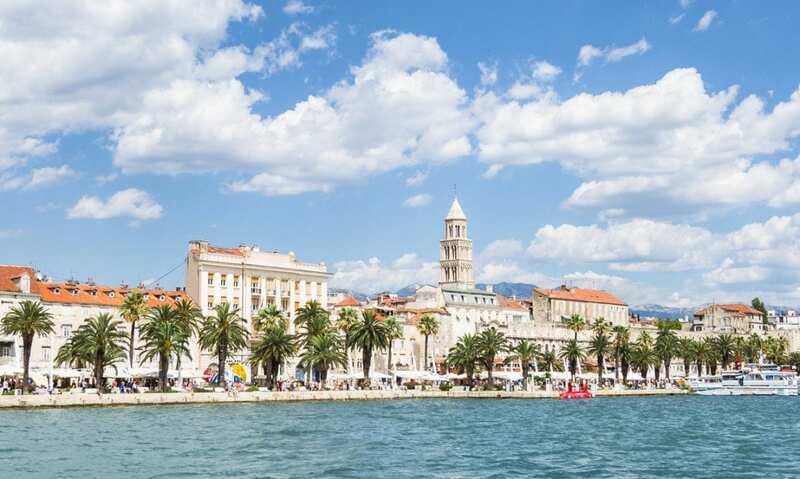 Split is an incredibly photogenic destination, and we’re sure you will want to take plenty of pictures of this beautiful city. You’ll also probably want to be in some of them. Selfies are fine but some experiences deserve to be captured with something a bit more high quality than your phone. Enter Localgrapher, a European company that offers professional vacation photo shoots. We did a private shoot with Localgrapher while in Split and couldn’t be more pleased with our experience. Their local photographer brought us to several stunning locations and managed to capture a number of fantastic shots of us, despite how awkward we can both be in front of the camera. We highly recommend this company that operates all over Europe, including in Split, Zagreb, and Dubrovnik. If you plan to book an apartment in Split, we highly recommend this one. It’s located on a small and quite street about 10 minutes walk north of the Old Town. The apartment is spacious (read HUGE! ), sleeps up to five people, and has everything you will need during your stay. It’s perfect for couples or families and the hosts couldn’t be more friendly and helpful. We lived here for ten days and loved it for the price. You will too. Dvor Hostel: Small hostel with 13 comfy and modern rooms, a kitchenette, and common rooms located in the oldest part of Split. Click here for more info, reviews, or to book your stay. CroParadise Green Hostel: Award winning hostel located in the historic center of Split with a nice vibe and atmosphere, and comfortable, nicely decorated rooms. Click here for more info, reviews, or to book your stay. 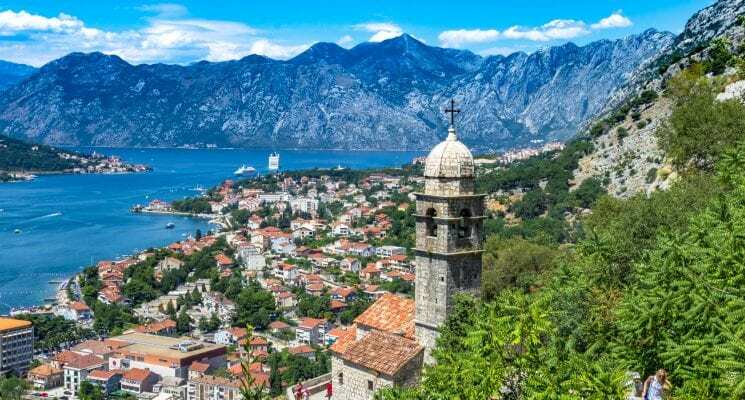 For more information on where you can stay without busting your budget check out our guide to the best hostels in Split, Croatia. Cornaro Hotel – We don’t normally stay in four star hotels, but we had the pleasure of calling Cornaro Hotel home for two nights. The hotel made such an impression on us that we long for the day we can return. Be sure to request one of their room in the new building and you won’t be disappointed. Beds are plush and cozy so we slept like babies and the breakfast was spectacular (even for vegans). Our favorite part though, was the rain shower in the bathroom. Absolutely amazing! Click here for more info, reviews, or to book your stay. Hotel Villa Diana – Small and cozy three star, family run hotel located near the beach and a few minutes walk from the Old Town. Ultra friendly staff and beautiful grounds make it one of the best hotels in Split. Click here for more info, reviews, or to book your stay. For more tips on where to stay in Split read our guide which breaks down some amazing accommodation options in Split in accordance to your budget. Luxury, boutique, and hostels, we cover them all! Dubrovnik is the fist sized diamond on top of Croatia’s crown. It is the premier tourism spot in the entire country and was recently made even more popular by the HBO show Game of Thrones. 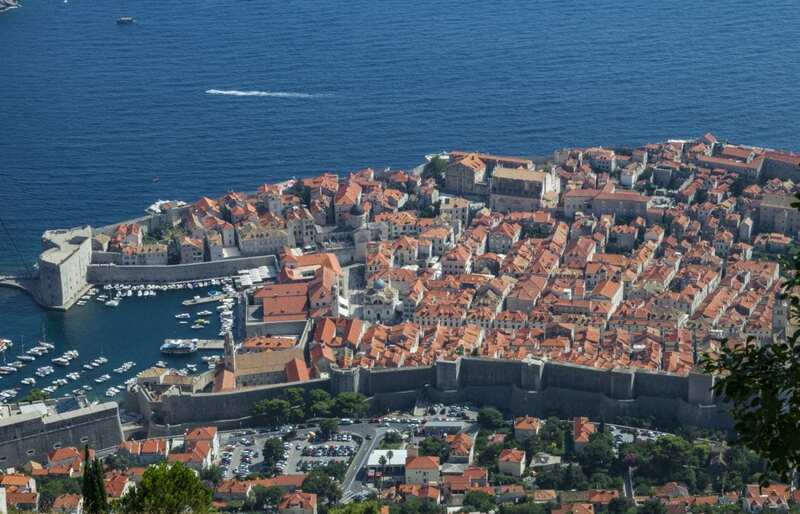 Even before it became a famous television star playing the all important role of King’s Landing, Dubrovnik was pretty darn popular. It’s easy to understand why. Situated on a sapphire blue strip of coast line, Dubrovnik’s Old Town is unlike any you will ever lay your eyes on. Surrounded by massive walls, bejeweled with orange and red rooftops, and crammed with immaculately restored architecture the city pops with ambiance and charm. Beauty and charm can be a curse however, and Dubrovnik suffers from a bit of over exposure. During high season the costs of travel in Dubrovnik can be prohibitively expensive for backpackers and budget travelers. High prices aside the city is also justifiably packed with eager visitors between June and mid September. How high is high, exactly? Well a dorm BED can climb to as much as €50 a night in July and August. Yes you read that right. Your best bet on staying in Dubrovnik for a couple of days is to rent an apartment with a couple of other people. If you keep your accommodation costs down under $30/day, and you cook your own meals, you can really stretch your budget in Dubrovnik for all the activities you might want to take part in. We didn’t stay in Dubrovnik for very long, since we visited in August and found prices to be a bit extreme. We have vowed to return in the off season however, maybe in late spring or early fall, to explore this spectacular city in a thorough fashion. Below is a list of things to do and things to see in Dubrovnik if you are there for only one day. If you are staying longer definitely do some more research! There’s no point in mincing words. Dubrovnik’s Old Town is stunning and lives up to every bit of hype it may have received due to the flood of tourism that has recently enveloped it. Wandering around its tiny streets for an hour or two guarantees one visual stimulation from its tiny buildings, charming views, and impressive monumental structures. Dubrovnik’s walls are massive, and have stood guard over the old center and harbor in one form or another since the 7th century. 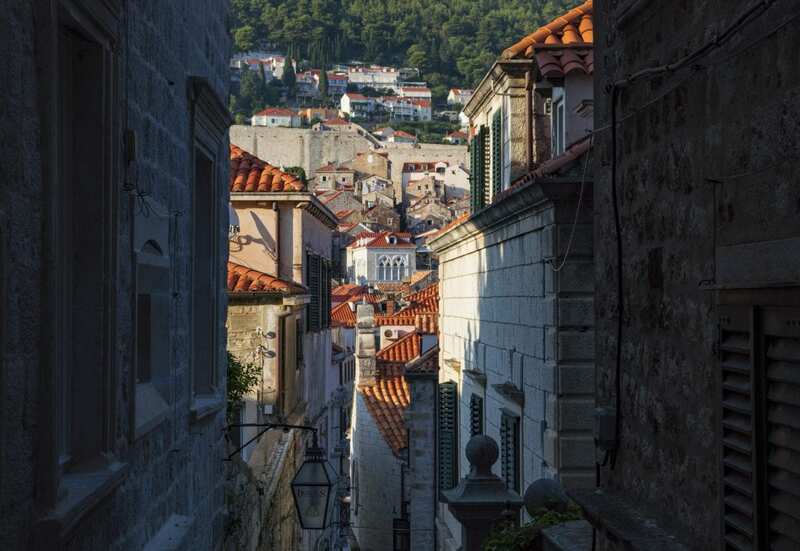 While exploring the street’s of Dubrovnik’s Old town we overheard an elderly woman say to her companion, “The last time I was here they didn’t charge to go up there.” as she nodded toward the city wall. We’ll warn you in advance, the price to climb the city wall is steep. 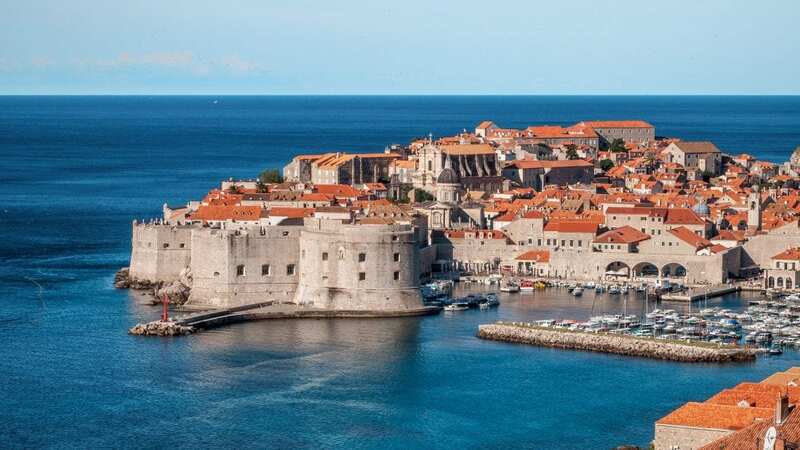 Nearly $18 usd, and while we cringe at the cost, the city wall surround Dubrovnik brings you just above the burnt orange rooftops, where you can admire its architecture and surrounding seaside from a different vantage point. One which somewhat disconnects you from the crowds below and allows you to take in the view with some measure of peace and tranquility. For an even more sweeping view of Dubrovnik, and stunning photos, take the four minute cable car ride up almost 800 meters above the city. Once there, don’t just stick to the building you exit the car into, but explore the surrounding area for a bit of piece and quite away from the crowds. You can also forgo paying the cable car fee and walk up to the vantage point on your own. This is a sweaty task in the heat of summer, but worth it for all the stunning views you will experience along the way. You’re in Croatia after all, and it would be a shame not to dip your toes into the crystal clear waters of the Adriatic. So, when in Dubrovnik during summertime take a day to head to the beach, cool off in the sea and relax! If you need suggestions on which beaches to visit, take a look at this! Hostel Dubrovnik Center: Ten minutes from the Old Town, and right in front of the Adriatic Sea, how can you possibly go wring with this hostel? As that isn’t enough, the hostel also has kitchen, outdoor area for mingling, decently priced drinks, and free kayaking from their private wharf. Click here for more info, reviews, or to book your stay. Hostel Villa Angelina Old Town: Considering the tourism explosion that Dubrovnik has recently experienced, staying in the Old Town can seem like nothing more than a silly dream unless you’re prepared to throw down copious amounts of cash. Fortunately, Hostel Villa Angelina makes it a reality with their affordable (for Dubrovnik) private rooms or dorm beds. Click here for more info, reviews, or to book your stay. For a complete list of the greatest hostels in town check out our article on the best hostels in Dubrovnik! Rooms Fausta Old Town: A one star hotel with an incredible location, friendly staff, and a price tag that can’t be beat. Click here for more info, reviews, or to book your stay. Sun Gardens Dubrovnik: Five star, waterfront property that’s a great choice for anyone who wants to treat themselves to a luxurious hotel during their stay in Dubrovnik. Click here for more info, reviews, or to book your stay. 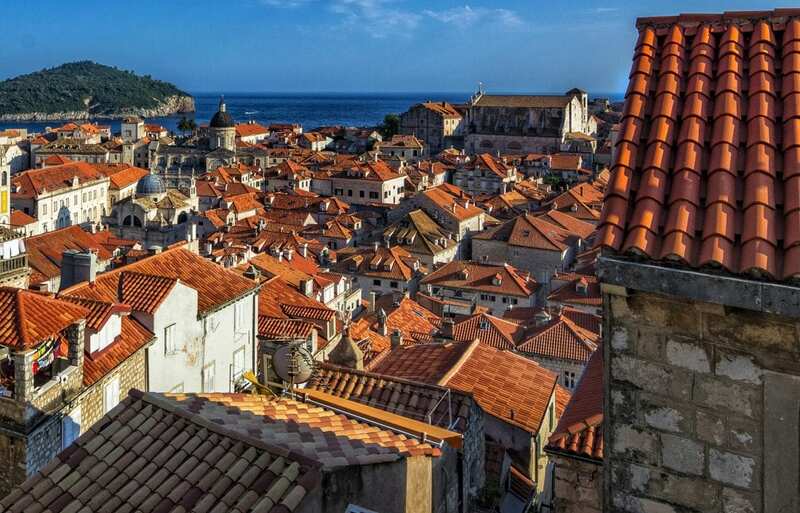 If you’re looking for more awesome accommodation options check out this fantastic guide on where to stay in Dubrovnik! 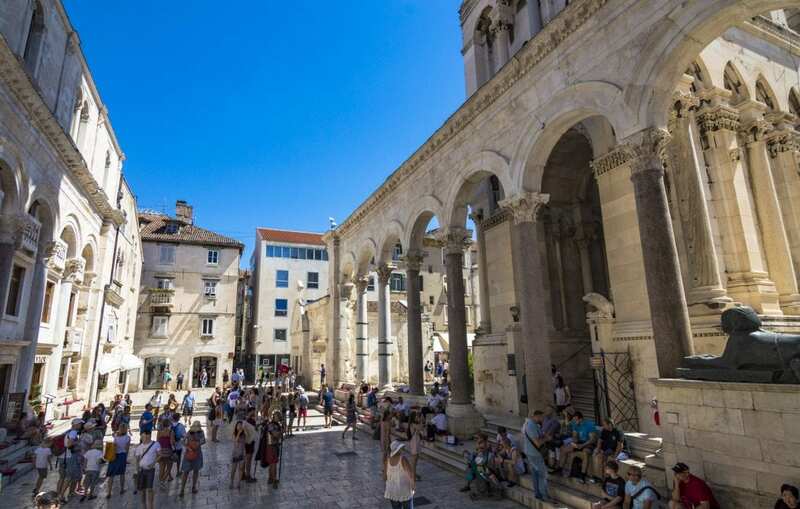 If you love Roman architecture Pula is a can’t miss destination while traveling Croatia. The city is packed to the gills with incredibly preserved Roman buildings. 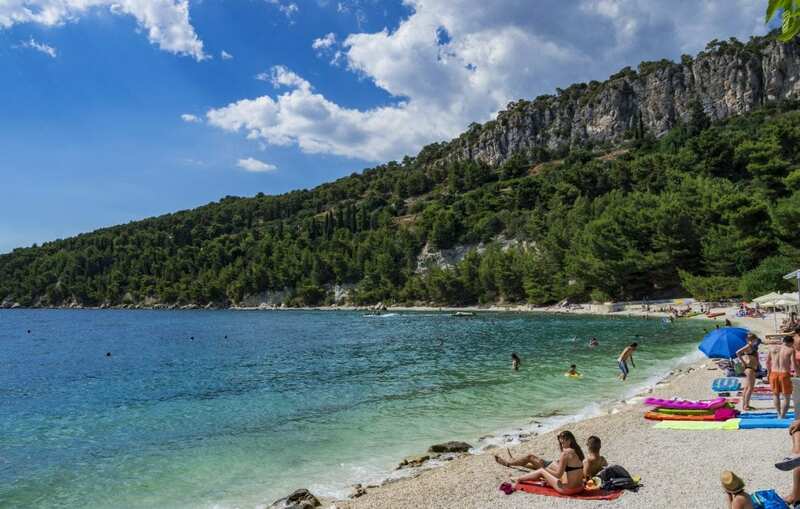 Those looking for beaches near Pula will find them within relatively easy striking range, to the south of the city on the Verudela Peninsula. Pula is one of the least expensive coastal cities in Croatia, which is a bonus. 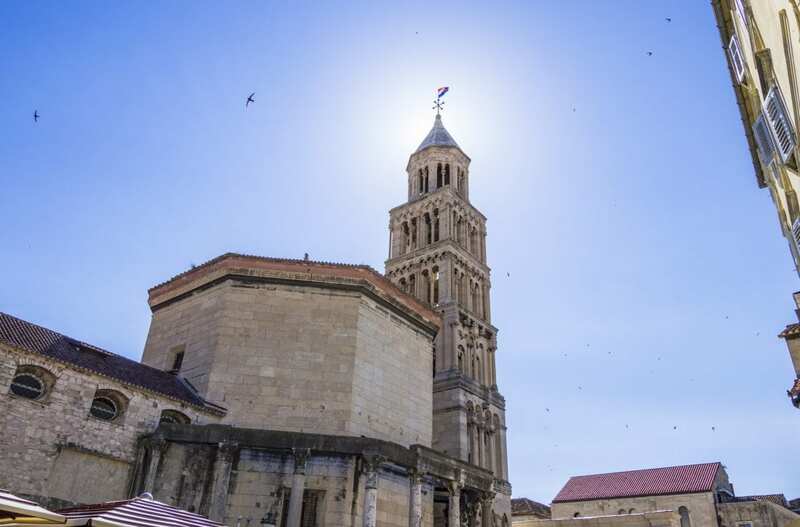 It’s a bit out of the way and harder to get to from Zagreb than it is from Slovenia, so if you want to visit Pula make it the first or last stop on your travel adventures in Croatia. 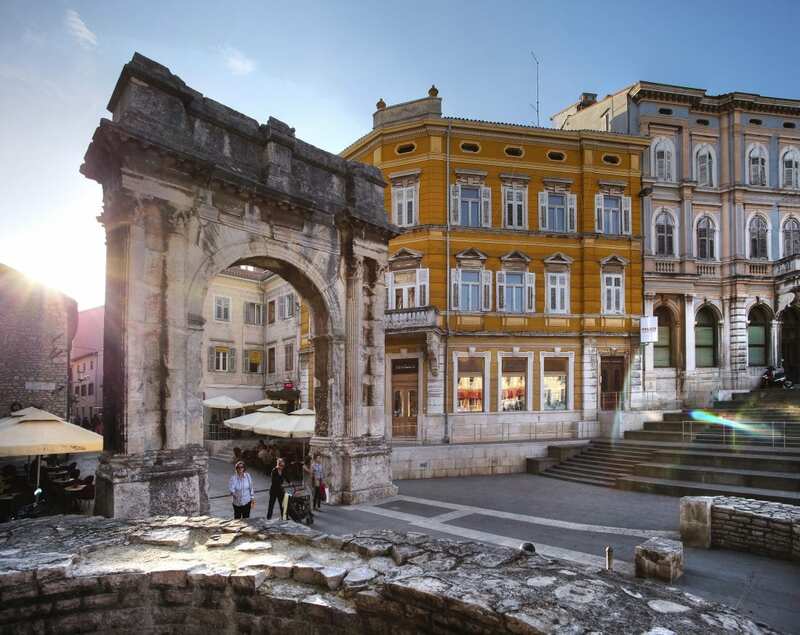 Pula’s architectural and historic crown jewel is the Roman Amphitheater (also called the Arena of Pula). It was built from local limestone in the first century AD and originally used for gladiator fights. Despite its age, the amphitheater hasn’t been retired and is used for concerts, festivals, events, and sporting competitions. As with Rome, all roads (or rather organized tours) lead here so it’s a difficult one to miss. 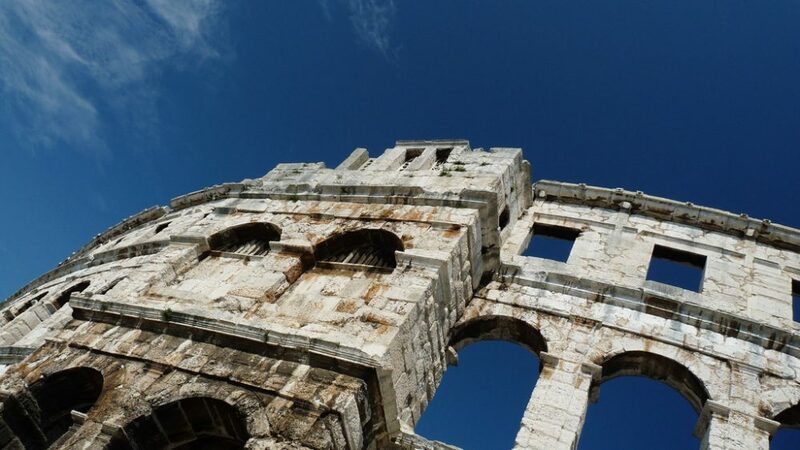 Embrace ancient roman mythology and visit the Temple of Augstas in Pula. The temple was originally dedicated to the goddess Roma and the Emperor Agustus. It was later used as a church, granary, and a museum. Unfortunately the ancient structure was destroyed in 1944 so what you see currently is a reconstruction. It’s still worth visiting, if you ask us. Zerostrasse is an underground tunnel system constructed during the Austro-Hungarian reign. It was intended to serve as a shelter for the city’s inhabitants during WWI and as storage for ammunition. Sections of the eerie tunnel system are currently used as gallery space and are open for public viewing. No surprisingly, Pula is another destination in Croatia with plenty of pristine beaches to choose from. For suggestions on which ones to visit, click here. Crazy House Hostel Pula: Centrally located in the Old Town, Crazy House is a small and cozy hostel with a full kitchen, saloon, terrace, and charming bedrooms. Click here to read reviews or to book now. Riva Hostel Pula: If you’re looking for a hostel in Pula with a fantastic atmosphere for socializing and an excellent location, you should definitely consider this one! Click here to read reviews or to book now. Boutique Hotel Valsabbion: Gorgeous three star boutique hotel located only 20 meters from the Adriatic and 3 kilometers from the city center. Rooms are spacious, newly renovated, and all have their own balcony. Click here for more info, reviews, or to book your stay! ArenaCentar Apartments: Apartments located in the center of Pula. All units come with a kitchen, microwave, refrigerator, private bathrooms, and free toiletries. Click here for more info, reviews, or to book your stay! And there you have it guys! Our rather lengthy budget travel guide to Croatia. As we said there is much to see and many things to do in Croatia. We recommend taking a minimum of three weeks in order to get the most out of your trip. If you don’t have that much time, no need to fret. Start in Zagreb, then hit up Zadar for a night before taking a three hour bus down to Split. 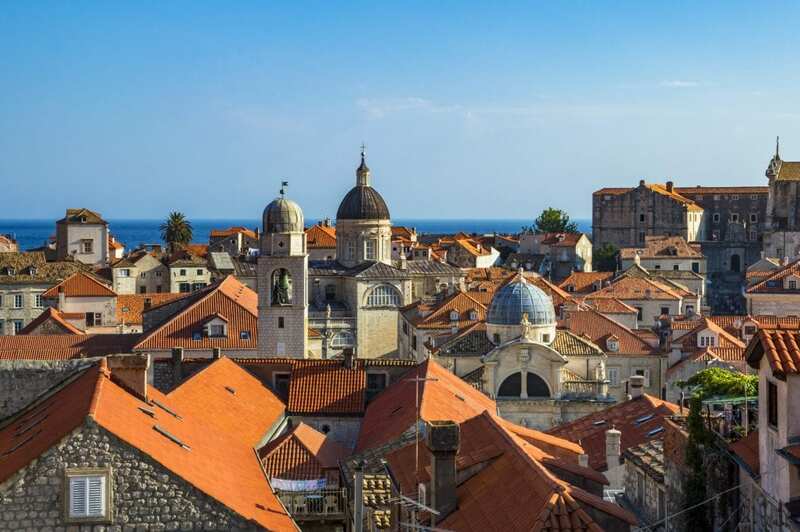 From Split you can take a very long day trip to Dubrovnik if you want to save money on accommodations. We will be writing individual guides to each of the cities we discuss above soon, so check back for that or sign up to our mailing list to get updates. And if you have any questions please feel free to leave them in the comments below, or shoot us an email! As always, safe and happy travels everyone! We’ll see you guys on the road! Big thank you to Croatia’s national tourism board, and the Zadar, Split, and Dubrovnik tourism boards for sponsoring part of our trip and/or providing us with valuable information along the way. Fantastic write up! We are heading to Croatia and would love to know the names of the beaches you recommend in Split? Thanks! Enjoy your trip!! When are you going? The beach west of Split that we most enjoyed was Kasjuni Beach. Zlatni Rat Beach on the island of Bol is one of ghe worlds best as is the Beach of Brela on the Makarska Riviera as well as being two of tbe best spots in Croatia. I have been numerous times from Australia and love Croatia. Hidden gems are Sibenik and the Krka falls, island Murter and the Kornati archipelago, Rastoke, Varazdin. Rovinj, Pucisca on the island of Brac and Vis island. Nice write up, we’re big fans of Croatia and have spent a lot of time here (Split is our favorite place – I’d suggest however missing it in mid-summer when it gets really busy). Thanks for the Solta tip, haven’t been yet. A favorite place of ours is the town of Omis for adventure activities (hiking, ziplining, river adventures). Pula we’re not big fans of (the arena nice though) but we enjoyed the hilltowns and smaller seaside towns of Istria (Porec, Novigrad). Hope you get to Solta, it was so nice and peaceful. We’ll have to check out Omis next time! I LOVE Croatia!!! I lived there for 23 years in a village outside of Porec. It is the most beautiful place. The people there are amazing. After being back in the states again for 18 years, we are still in contact with most of the people there. we hope to move back when my husband retires. I love all your articles . It is very helpful for my upcoming trip to Slovenia and Croatia. How many days do you recommend staying in Lubjljana and do I really need to stay in Lake Bled or a day trip will do. I am planning for Nov 1-7 and a day trip to Trieste Italy. For Croatia I will be coming to Zagreb from Ljubljana, staying fr Nov 7-11 with a plan to visit Plitvice Natl Park and Split but having read your article, I was tempted to include Zadar. How many days do I spend in each place? I need to go back to be in Zagreb on Nov 11 for my flight out to Vienna. I am looking forward to hearing from you. BTW, I am Zinky Logarta, a solo traveler, female 50 who loves to travel . Thanks for the kind words. If you can visit Lake Bled and Lake Bohinj all in one day then a day trip should be enough. I enjoyed staying in the area for a few nights, however. If you only have 4 days in Croatia you should probably sacrifice one of the locations you want to visit, to be honest. I need your honest opinion. 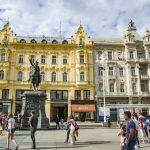 Which place do I need to give up in my trip to Ljubljana? Maybe I’ll just save Trieste for my next trip? How many days do you suggest I allocate, Ljubljana and Lake Bled? In Zagreb, I see that Zadar is a must visit right? can I do a day trip or I really have to spend overnight there? I think you need to use your best judgement and discover for yourself. We can only give you details on places, but we aren’t YOU, so we don;t know what you would enjoy the most. As for Zadar, yes you can do a day trip, but you will probably miss out on watching an amazing sunset there if you do so.